Tancredo Neves was a sensible politician with a reputation for honesty who aided the implementation of democracy in Brazil following military governments. He was Prime Minister of Brazil from 1961 to 1962. He was one of a handful of opposition leaders who were able to remain in Brazil throughout the dictatorship. Neves was born in Sao Joao del Rei on March 4, 1910. The Neves family name comes from an Azorean great great grandfather. Tancredo Neves was a descendant of Amador Bueno, a noted paulista from the colonial Brazilian era. By formal education he was a lawyer. He entered politics at the age of 24 in the Progressive Party (PP). He began his political career as a member of the legislative chamber of his hometown of São João del Rei (1935-1937), and was elected in 1947 to the Minas Gerais state legislature. Three years later in 1950 he became a representative of his state in the Brazilian Chamber of Deputies in the Social Democratic Party (PSD). 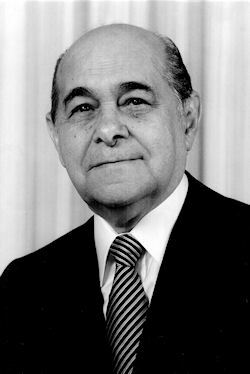 From 25 June 1953 he was appointed by President Getúlio Dornelles Vargas to be the Minister of Justice and Internal Affairs. Neves served in that post until Vargas committed suicide in 1954. Again elected Congressman (1954-1955) was director of Banco de Crédito Real de Minas Gerais (1955) and Portfolio Rediscounts Bank of Brazil (1956-1958). Took over the Department of Finance of the State of Minas Gerais (1958-1960). In 1960, Neves ran unsuccessfully for governor of Minas Gerais. During the political crisis that began with the resignation of President Jânio da Silva Quadros on August 25, 1961, a parliamentary system was installed in Brazil by a constitutional amendment passed on September 2, 1961. Neves was appointed as Prime Minister by President João Goulart and served from September 1961 until July 1962. The parliamentary system was abolished by plebiscite in January 1963. Elected congressman in 1963, but Goulart was overthrown by a coup in 1964 . With the extinction of political parties and enactment of bipartisanship by decree AI-2, of October 27, 1965. Neves, who had up to that point been considered a moderate politician, became an opponent to the military regime. He joined the MDB, becoming one of its leaders. He was reelected congressman followed times (1963-1979). He was elected Senator in 1978. With the return of multiparty politics, he founded the Popular Party (PP), and under this legend, continued to exercise his mandate (1979-1982). He joined the PMDB and was elected governor of Minas Gerais (1983-1984). In 1984, he was one of the leaders of the Diretas Já [Direct Yes] movement that demanded direct elections for President of Brazil. The campaign for direct elections failed. There was no popular public vote. In late June 1984, the Liberal Front dissident group split from the military government's PDS (Democratic Social Party) and joined the PMDB led by Governor Tancredo Neves (Minas Gerais). In August 1984, while Governor of Minas Gerais State, Neves was named presidential candidate for the liberal alliance. Neves was the opposition candidate to succeed President João Baptista de Oliveira Figueiredo. In the second half of 1984, massive rallies engulfed Brazil, as the Tancredo Neves-Sarney ticket consolidated its 300-vote margin over Paulo Maluf (PDS-São Paulo) in the electoral college. At the presidential selection in January 1985 Neves was elected Brazil's first civilian president for 21 years. Opposition leader Tancredo Neves, a 74-year-old centrist politician who has pledged to "change Brazil," today was elected the nation's first civilian president in 21 years. The Electoral College gave Neves 480 votes to 180 for the only other candidate, Congressman Paulo Maluf, 53, of the military-backed party. Twenty electors in the 686-seat body were absent, and six voided their votes. Celebrations began immediately in South America's most populous country. On that day, Brazilians and Brazilianists gathered to celebrate Tancredo Neves' election as Brazil's first civilian president in 21 years. They gathered to drink a toast to the possibilities of a new Brazil, and to rejoice in Tancredo himself -- for he symbolized "hope," a word and a feeling that Brazilians had been forced to forget. However, he collapsed the night before his inaugural, and the presidency passed to Vice President José Sarney (president, 1985-90), long-time supporter of the military regime. The diagnosis was benign infectious bowel tumor. Neves suffered from abdominal complications and developed generalized infections. For the next five weeks, the population was subjected to constant news flashes about Neves' oscillating health due to post-surgical complications. Amid growing concern for the stability of Brazil's new democracy, President-elect Tancredo Neves underwent abdominal surgery March 27, 1985 for the third time in 11 days. Doctors who performed the operation in Sao Paulo said it was successful, but Neves' press spokesman warned that the convalescence would be lengthy. The latest surgery, which came after confident medical predictions that Neves would soon be back at work, stunned Brazil. By 15 April 1985 doctors had exhausted all treatments for Brazilian President-elect Tancredo Neves, whose condition deteriorated sharply after his seventh operation in a month. "The president is in a practically irreversible state," Antonio Brito, his spokesman, said. A medical source at Clinicas Hospital said, "There is not the slightest possibility he could survive if the machines were switched off. Neves died on April 21, more than one month after the beginning of his term of office, without ever having taken the oath of office as President. Tancredo Neves is counted among the official list of presidents of Brazil as a matter of homage and honour, since, not having taken the oath of office, he technically never became President. The Law No. 7465 of 04/21/1986, in Article 1, determined that "the citizen of Tancredo Almeida Neves, elected and non-sworn, by reason of his death, appear in the gallery who were anointed by the Brazilian nation to the Supreme Magistracy, for all purposes legal". The hopes that 1985 would be a quick transition to a new regime faded as Brazilians watched this turn of events in a state of shock. Like the regime changes of 1822, 1889, 1930, 1946, and 1964, the 1985 change also proved to be long and difficult. José Sarney took over as acting President and implemented the commitment of Neves, including restoring direct elections by universal suffrage.